We all love lasagna. There’s something about the combination of pasta, tomato sauce and melted cheese that spells “comfort”, and Amy’s has the perfect fix that’s both vegan AND gluten-free! 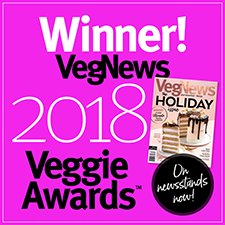 They’ve created a delicious vegetable lasagna made with organic spinach, zucchini, sweet carrots and tofu mixed with luscious, melted Daiya vegan cheese between layers of tender rice pasta. And, of course, don’t forget the sauce – Amy’s own authentic Italian sauce made with vine ripened tomatoes ties everything together into the ideal convenience meal that bakes to perfection in 35-40 minutes, or, microwaves in only 4-5 minutes. 9 oz. 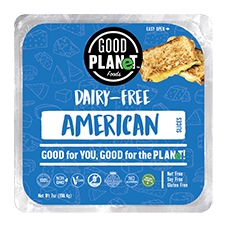 (255g) package is $5.99. From Christine L of Houston, Texas on 7/16/2018 . This is good! I liked it. I would buy again on a whim. 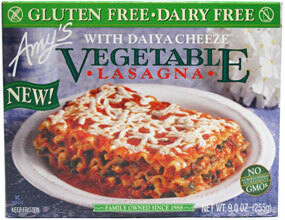 I find a lot of amy's frozen foods very hit-or-miss. I thought the picture was a bit deceiving. Once opening, you'll see the lasagna is a lot flatter and doesn't have that much filling. But decent for convenience foods. From Anonymous of Carthage, Missouri on 4/15/2018 . Tasty, but does not resemble the thickness as shown on the box. It may be 1/2" thick actually, not multiple layers as shown. Little too salty, for us who choose to limit salt. I tried heating this lasagna, but my oven doesn't work. I would eat frozen bits every now and then, but it still managed to taste delicious. I recommend it. From Anonymous of Atlanta, Georgia on 4/17/2016 . I haven't had lasagna since my husband last made it MANY years ago, so I was cautiously thrilled to find that Amy's had a vegan version. Tried it, LOVED IT, and have bought LOTS of it since. After I first found it, it's about all I ate for dinner for a week. Mind you, this is coming from someone who has craved lasagna for years, so those who've been eating it all along may not be quite as thrilled, but I really enjoy it. From Michelle Farah of Coquitlam, British Columbia on 10/12/2014 . Allergens This item is manufactured in a facility that also processes wheat, soy, milk, tree nuts, and seeds.